The casino experience is defined by the slot machine. Row after row of the bright blinking lights with the noisy spinning numbers and symbols scream out for you to sit down and play for a while. They are the favorite game of the casual gambler who just wants to have a bit of fun without risking too much money, while all the time hoping there is one lucky coin in their bucketful that will hit the jackpot. The slot machine, also called the “one armed bandit” and sometimes known as a “fruit machine,” are usually coin operated with three reels that spin when a player pulls down on the lever. You win traditionally when all three reels stop on the same number or symbol, though modern slot machines have all kinds of unique rules and some have more than three reels. There are two different kinds of slot machines. There are progressive slot machines and straight slot machines. Progressive machines offer pay outs that reflect the amount of money a player has put into the machine while straight slots pay out the same amount every time. Because of the machinery and technology involved, the history of slot machines only goes back 120 years. 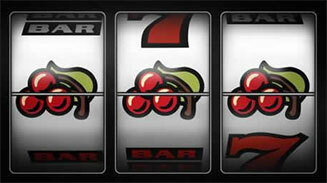 Now slot machines are the one of the most popular features of casinos all over the world and on-line as well. Click to book your Las Vegas tours. Due to its young age relative to other forms of gambling, the history of the slot machine can be traced exactly. The first slot machine was created in 1891 by the Sittman and Pitt Company in Brooklyn, New York. This earliest version of the machine is thought by many to be the father of the present day version. The Sittman and Pitt Company machine was based around the game of poker. It had five drums that between them had fifty different card faces. Pay outs were determined by the poker hand that would be made up by the result of the five spinning drums. Generally the game cost a nickel a spin. One major difference between these machines and the modern day version is that the early machines actually didn’t make pay outs in cash. Instead the prizes would be drinks, cigarettes, or food from the bar depending on how good the displayed hand was after a player pulled the lever and spun the drums. The early slot machine was an instant success, and shortly after they were introduced almost every bar in the city had one. Bar owners also learned how to decrease the odds of their patrons winning by taking the Jack of Hearts and Ten of Spades out of the deck. The man known as the father of the slot machines is Charles Fey. A German immigrant to the United States, Fey lived first in New Jersey and then settled in California. In his twenties Fey was told he had tuberculosis and that he had less than a year to live. He turned out to prove his doctors wrong and did more than just live, he became a gambling legend. Click to book your Las Vegas tours. It was in the 1880's that Fey created the first modern version of the slot machine. He named it the Liberty Bell and built it in his San Francisco workshop in 1887. The Liberty Bell was a little smaller than today’s machines but otherwise was basically the same with its three reels with twenty symbols that spun when the lever was pulled. The Liberty Bell was hugely popular and Fey had to work overtime mass-producing the machines just to keep up with the demand. The reels on the Liberty Bell featured stars, bells, horseshoes, and the more familiar hearts, spades, clubs, and diamonds. The game cost five cents to play and the pay outs depended on the results displayed on the three reels when they finished spinning. Generally a player would win as much as twenty coins for hitting three bells and as few as two coins for hitting two horseshoes, and there were other variations in between those two. Fey was both a clever inventor and smart businessman. He realized he had created something that was in high demand so instead of simply selling his slot machines, he also charged the gambling halls that wanted them a 50% commission fee. He wouldn’t sell the rights to distribute or make the games to anyone else either despite being approached by many different manufacturers. Fey finally did forge a partnership with the Mills Novelty Company in 1907. They produced a new version of the game known as the Mills Liberty Bell where the machine was set in cast iron and the reels featured face card symbols like the Jack, Queen, and King. This was also the first machine that had a bell which would ring after a winning combination was displayed, though that was taken out of the game later on. This design though would become the basic standard for the modern day slot machine. A few years later in 1910 the Mills Liberty Bell was re-designed into a more lightweight version and was also given a new name. The new machine was called Operator Bell. Other changes were a gooseneck coin deposit slot and the reels featured fruit symbols. Around 30,000 of these machines were created, still set in cast iron, and despite weighing more than 100 pounds their popularity continued to spread. It wasn’t until 1915 that the Mills Novelty Company decided the cast iron machines were too expensive to make and too heavy so they switched to wood cabinets that would instead hold the game. These were cheaper to make and the machine became easier to assemble than the other versions set in cast iron. The Mills Novelty Company instituted a number of different changes to its slot machines in the 1930's which helped further increase their popularity. First off, as mentioned earlier, the bell was removed. This version of the game became known as the Silent Bell. Double jackpots were also introduced allowing a player a chance to win the jackpot twice in a row. The look of the machines also changed in this period. Various designs and patterns on the exterior wood cabinets were created to make the slot machines more attractive and give them a more exciting look. New themes were added as well like the Lion Head, Roman Head, and War Eagle in 1931 and Castle Front in 1933. The popularity of slot machines continued to increase throughout the 1930's and continued to skyrocket in the early 1940's. After Bugsy Siegel put slot machines into his Las Vegas Flamingo Hotel all the leading gambling halls and casinos were rushing to add them. The original idea behind putting slot machines in casinos was to keep the wives and girlfriends entertained, allowing the men to spend more time doing the “real” gambling. However, casinos quickly noticed the slot machines were bringing in more money than many of the other games on the casino floor. Click to book your Las Vegas tours. Slot machines were mechanical in nature up to this point but in the late 1950's a new type of electro-mechanical machine was created. Slot machines were at the peak of their popularity with new machines like the Big Bertha and Super Big Bertha introduced to the casino floor. The Big Bertha series was a very large machine that ran on a five horsepower motor that cost more than $150,000 to manufacture. The machine had to be large because it had eight reels with 20 symbols each instead of the standard three. It also only offered an 80% payout and the odds of a Big Bertha machine hitting the jackpot were designed to be one in 25 billion. What attracted a lot of attention to the Big Bertha machines was that they accepted higher denominations of coins which meant bigger jackpots for players and higher profits for casinos. Another revolutionary slot machine was introduced in 1964. It was also an electro-mechanical machine known as Money Honey. It was created by Bally Manufacturing and was the first machine that was dramatically different from the original design by Charles Fey. While there were major changes inside the machine with levers and springs being changed to components that were electric, the biggest changes were on the outside of the game. Because this was an electric machine it could emit flashing lights and lots of sound effects to enhance the experience. The lights and sounds became especially loud when a jackpot was hit. In general, another feature of the electro-mechanical machines were that they had multiple coin play which meant there was the potential for players to win higher jackpots. The next era that saw an evolution in the development of slot machines came in the 1980's. At the time a new company call Sircoma caused a sensation in the gambling industry with its creation of a video poker slot machine. It was not an immediate success though with a lot of gamblers suspicious of the video aspect of the game. There was a distrust that the game may not be completely random because they couldn’t actually see the reels spinning. However, gradually the apprehensions subsided and the game became a success. This era of computerized games gave players more options and choices among the types of games that were available. These games also accepted bills for the first time. This allowed players to spend more time gambling and less time waiting in line to get change. The other revolution was having many different games available on the same machine. This allowed a player to change games without having to get up and move to a different machine. Many of the machines offered staggering jackpots and bonus features that attracted players with the chances of winning more money. In today’s casino slot machines are responsible for about 30% of the profits. Slot machines now have little in common with the silent machines in the 1930's. Now they are very noisy machines with bright blinking lights designed to attract players and create a loud and bright event when there is a big winner. Even the casings now feature flashy lights and have large metal coin trays designed to catch the jackpot after its been won. The machines are placed on the casino floor in an area designed to attract crowds and it’s thought that the most visible machines are programmed to provide more frequent wins to encourage others to play and get in on the action. Today’s machines are run by random number generators that reflect what is displayed on the spinning reels. Most machines have a maximum bet of two to three coins though other machines offer a wide variety of options. The maximum number of coins being bet increases the chances of winning the most money. Today the biggest area of growth for slot machines isn’t in a land casino; it’s in the many online casinos around the world. Online gaming has forever changed all forms of gambling and slot machines are no different. At one time games of chance could only be played at a casino or gambling hall while now they can be played by anyone, anywhere- as long as they have a computer and a link to the internet. When online casinos began to take off software providers were busy developing many different slot machine games for many different sites. There are more than 2000 online casinos that offer progressive slots and straight slots. Many games have very large jackpot prizes with large bonuses. There are even online casinos dedicated solely to slot machines. The bells, whistles and excitement of slot machines in a casino can now come right into your living room with these internet games!